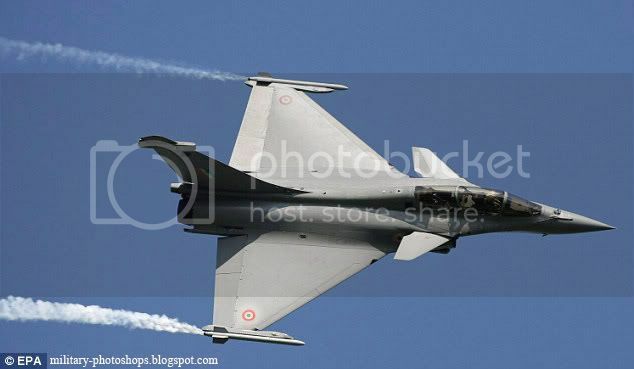 Rafale in Indian Airforce colors. Rafale in Indian colors. Let me know if any more changes are needed to make it more Indian . French Dassault fighter aircraft Rafale has been selected to be the Medium Multi Role Combat Aircraft (MMRCA) of the Indian Air Force (IAF). Dassault beat the four-nation consortium’s Eurofighter on price, with the fighter being identified as L1, or the lowest technically qualified bid. StratPost understands that Dassault has been issued a letter from the Ministry of Defense, communicating their selection. Three representatives of the Eurofighter consortium were also summoned to the Ministry of Defense at South Block on Tuesday afternoon, when they were informed of their loss in the competition. The bid was originally estimated to be worth USD 10.4 billion, as per the budget estimate approved in 2007, but it is likely to have faced a substantial escalation in cost, keeping in mind inflation and the fall in the value of the Indian Rupee. Saw your work, you are an amazing artist. Added you to my Blogroll.